Much scientific research has shown that Bisphenol A (BPA) poses many health risks to humans. Among such risks include exposure to prostate and breast cancer, brain development abnormalities, reproductive systems complications, and cardiovascular conditions. 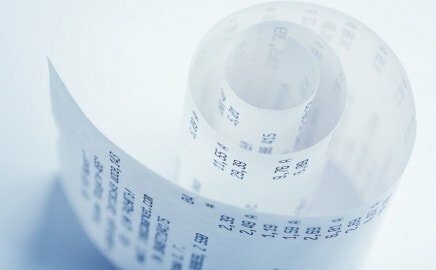 While food is often the primary source of BPA (because most of our foods come packed in BPA-coated cans and plastic bags), thermal paper receipts is also a common source of BPA. In a study done by The Environmental Working Group, high amounts of BPA were found in over 40% of receipts collected from fast food outlets, shopping malls, gas stations, and grocery stores. And as John Warner, Ph.D., of the Institute for Green Chemistry says, a single thermal paper contains more BPA than a polycarbonate water bottle would release for years. 1. Use nitrile gloves when handling the BPA-coated receipts. This is particularly useful to cashiers who have to hand out the receipts several times. In one study, it was found out that cashiers that handed out thermal receipt papers had higher BPA levels compared to those that handed BPA-free receipts. BPA can readily be absorbed through the skin, so it is advisable that you put on the gloves not only when handing out the receipts, but also when cleaning the receipt machines and changing the receipt rolls. 2. When handed the thermal paper receipt, keep it away from other items. In case you need the receipt, fold it (the printed side on the inside) and put it in your bag or pocket away from any items like food, coins, or handkerchiefs. Also, avoid placing the receipts in your wallet. At home, remove the receipts and keep them in a sealed envelope, a sealed plastic bag, or in a drawer dedicated to receipts to avoid any contact with items you will need to use later on. 3. Do not handle thermal receipt papers with greasy hands or just after using alcohol-based sanitizers. Scientific studies have shown that alcohol-based cleaners and lotions increase the ability of the skin to absorb BPA. It is therefore advisable that you don’t handle these receipts with greasy hands. This also means that you should not wash your hands (before or after using the BPA-coated receipts) with the alcohol-based sanitizers. Instead, use plenty of running water and soap. Handling the receipts with wet handles can also increase the risks. Cashiers are therefore encouraged to see to it that their hands are dry when changing the receipt rolls, and cleaning the receipt machines. 4. As much as possible when handling a thermal receipt paper, avoid hand-to-mouth contacts.Again, the most exposed groups of people here are the cashiers, store clerks, and cashiers who have to hand out receipts from time to time. While it may sometimes be involuntary to touch your lips after handling a receipt, it is advisable that you become more alert and avoid doing this. You can pick up and ingest BPA quickly through the mouth. 5. Wash your hands thoroughly after handling thermal paper receipts. This is especially important before handling any food items, cooking or eating. And, as noted earlier, avoid using alcohol-based cleaners or hand wash lotions to clean your hands. Use water and soap only. Another important thing to note here is that if you have to hand out a receipt, keep it as dry as possible. Avoid keeping the receipts close to, say, a moist glass or placing them directly on food. 6. Avoid handing a thermal receipt paper to the high-risk population. A study published in the American Medical Association Journal points out that BPA poses more risks to small children, infants, pregnant women, and nursing mothers. There is the need, therefore, to as much as possible, avoid exposing this population to the health risks that BPA presents. Ask pregnant women and nursing mothers if they need a receipt before handing it to them. Also, you can ask them if they would instead prefer it emailed to them. You should never give thermal paper receipts to young children, or infants. At home, keep the BPA-coated receipts as far away from children’s reach as possible. You can, for instance, keep them in a locked drawer. 7. Do not recycle the BPA-coated receipts. Recycling these receipts means the BPA may end up various products like paper towels, or shopping bags. Again, the chemicals can end up in exhaust fumes or waste water from the recycling plant. The best solution to this would, therefore, be getting your receipts emailed to you.